This is the story of an independent company by the name of the Pulaski Cadets. The time was shortly after the war of 1812. The origin of the unit actually is rooted in the famous Pulaski's Legion of 1778. 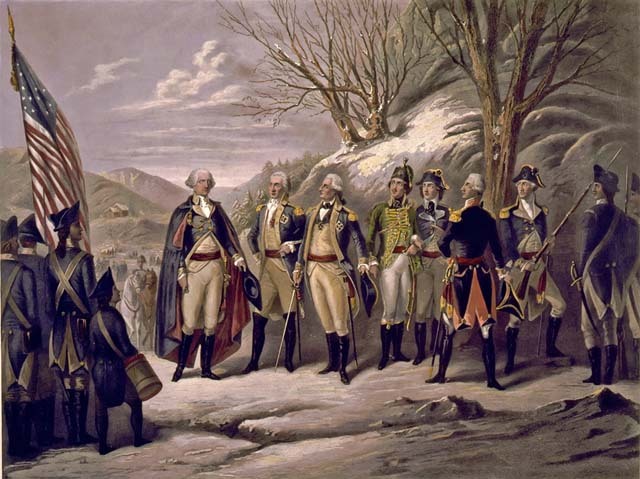 General Washington standing with Johann De Kalb, Baron von Steuben, Kazimierz Pulaski, Tadeusz Kosciuszko, Lafayette, John Muhlenberg, and other officers during the Revolutionary War. Artist: Frederick Girsch, 1821-1895. Kaziemierz Pulaski, recommended by Benjamin Franklin, arrived in America on July 23, 1777, landing at Marblehead near Boston. After reporting to the headquarters of George Washington, Commander in Chief of the Continental Army, and offering his services to the Continental Congress, Pulaski threw himself into the first battle on American soil near Brandywine Creek. On September 15th, Pulaski was nominated to the rank of a General of Cavalry and the Commander in Chief of the American Cavalry. He fought at Germantown covering Washington's retreat, patrolled the area around Valley Forge during the winter, moved to Trenton and then, under Gen. Anthony Wayne, he fought the British at Haddersfield, New Jersey. His deputy at that time was Col. Michael Kovats de Fabriezy. In March of 1778, while at Yorktown, Virginia, Pulaski presented to Congress and received permission to form an independent Legion. The headquarters of the Legion was established in Baltimore and in May the Legion received its banner made by Moravian nuns. On September 15, 1778, General Pulaski reported to Washington ready for action with his Legion. At Egg Harbor, the Legion suffered serious losses. The Legion moved to Trenton, and then to Minisink to carry out action against the Indians. In February 1779, Washington ordered the Legion to proceed from Yorktown in the direction of Savannah. In May, the Legion took part in the battle for the city. On October 9th, General Pulaski was mortally wounded in action and died on the brig Wasp. His body was buried at sea. On October 21st, a symbolic funeral was conducted in Charlestown. At the time of the Revolution, the American Cavalry was never used in large-scale units. It actually was divided into small portions which were attached to larger infantry groups. Large cavalry groups used as breakthrough units were at the time not well appreciated by the American commanders and by congress. This was the main reason why Pulaski decided to organize his independent Legion. After the revolution, the Pulaski Legion was ordered to march with other units to New York to defend that most important port of the new nation. The Legion marched through Virginia, Delaware and New Jersey. In New York, the units were reorganized and employed in the defense of the port. The early years of the nineteenth century were time of struggling growth for the relatively new nation of the United States. As a national military experience, the War of 1812 was a high point during the first quarter of the century. This experience included grievous reverses along the Canadian border and the burning of our national capital. It included, as well, victories on Lake Erie and at New Orleans. Following the War of 1812, the national reaction was to reject the martial spirit and the idea of war. In general, in those post war years, the morale, discipline and esprit de corps of the military forces of the union and of several states declined. However, there were some individuals and organizations which, counter to the spirit of the time, continued devoted and dedicated military service. They were the descendants, the sons and grandsons, of the old veterans of the famous revolutionary military units. The tradition was passed down through the generations, Pulaski Legion veterans included. In 1826, the Boston Light infantry, known as the Boston Tigers, well disciplined and drilled, visited New York. The Company's excellent appearance, skill and precision in military exercises were admired and applauded. They inspired Col. William W. Tompkins, a West Point graduate, and other tradition minded individuals to organize an elite military company. Col. Tompkins recruited and equipped a Light Infantry Company named Tompkins's Blues that was given the title of the New York Light Guard. In 1833, some descendants of Pulaski Legion veterans, being a little unhappy in Tompkins's Blues, decided to resign from the company. Under Capt. William M. McArdle, a grandson of a Pulaski's Legion veteran, they organized their own unit and named it the Pulaski Cadets, reviving the tradition of the famous Pulaski's Legion. In 1839, the company was given the official title of the New York City Guard. Tompkins's Blues and Pulaski Cadets were elite military units with high skills and stringent discipline. The Pulaski Cadets were attached to the 11th Regiment as 1st company, then to the 22nd as B Company. When the regiment was disbanded, the Company moved to the 55th Regiment as Company G. They found their position to be rather awkward in the 55th as Regiment members were almost totally of French extraction and spoke mostly in French. The Company's transfer request was granted and it was moved to the 9th Regiment, now the 224th Coastal Artillery. At the outset of the Civil War, Company Commander Capt. Lovell resigned his command and his commission. He joined the Confederate Army as a Major General. In the Civil War, nearly all of the original pre-war members of the Light and City Guards became commissioned officers in various branches of the service. Many of them served with honor and distinction during the war and owed their promotions to the training they had received in their pre-war companies. The tradition was kept alive, and many of the former members resigned their commissions and came back to their units. The organization of the Militia (now known as the National Guard) made it impossible for any company of a regiment to continue on a semi-independent status. In order to effect a survival of these famous units, a bill was passed in the State Legislature of New York in 1867 incorporating the two organizations as a Veteran Battalion of the State Militia under the title of the Old Guard of New York. The Battalion was allowed to wear their traditional uniforms for parades and social functions; otherwise, the regular uniform was to be worn. After the First World War, the tradition of the company bearing the name of Gen. Pulaski was lost. In order to continue the tradition and to commemorate the hero of two nations, the Company of The Pulaski Cadets was revived and organized anew in 1985 mostly through the efforts of Brigadier General Jan K. Krepa (former Chief of Staff of the New York National Guard and first Commander of The Pulaski Cadets) and Lieutenant Colonel Tadeusz Wieniawa-Dziekanowski.